What's the most awesome wheelie ever done? Wheelies are the first trick we learn on our bikes (though not so much on our skateboards). For some of us, whole summers were spent "wheels up," trying to emulate our wheelie heroes. What's the coolest wheelie ever done? No doubt, it was the Little Red Wagon. The most Dodge A100 dragster of all time seemed like the most unlikely dragster ever (it was), turning the wheelie into a kind of pop art. 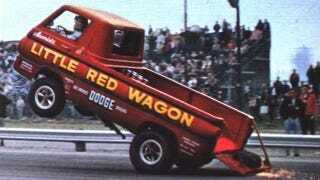 Bill "Maverick" Golden's pickup was the first "wheelstander," whose time in the quarter-mile was less important than the show it put on at launch.